For the sauce, first cook the árbol chilies for a few minutes. Then roughly chop the vegetables and roast them until they are fully browned. Blend all the ingredients, pass the mixture through a chinois and set aside. For the Chive Mayonnaise, blend the sunflower oil and the chives to make chive oil. Then incorporate the chive oil into the mayonnaise until you obtain the desired texture and colour. Put the mixture into a piping bag. Store in the refrigerator. 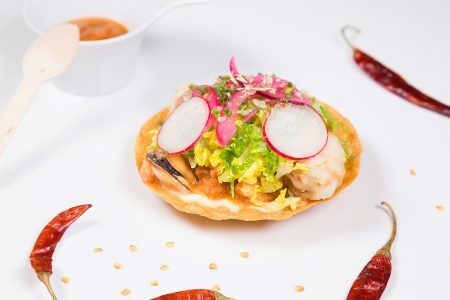 For the tostada, sauté the prawns, the shrimps and the octopus. Cool and vacuum wrap them. At the same time, fry the corn tortilla wrap in the fryer. To prepare the recipe, reheat the prawns, the shrimps and the octopus in the SmartVide at 70º for 7 minutes. Meanwhile spread the chive mayonnaise on the toast and randomly scatter the warmed seafood on the top. Place the julienned lettuce on top of the seafood and then add the fried cubes of hake and the mussels, cut in half. Finally, lay on red onion. To finish, dress lightly with the house vinaigrette and garnish with a sprinkling of finely-chopped chives. To plate, place the toast on a slate place and serve it with a ramekin of Mexican sauce. In this recipe, the vacuum system means that we can remove the toast at the optimum temperature without having to worry about it drying out or the seafood spoiling. What is more, if we pasteurise the ingredients, we extend the shelf life of our product.